My husband and I both love sauces and gravies of all types. From your average garden-variety beef or chicken gravy to cream gravies, hollandaise sauce and bearnaise sauce... Well, you just can't go wrong with a good sauce. And I wanted a good saucier. Sauciers are great for sauces and gravies because the entire inside is rounded, so there are no edges or corners that your whisk can't reach. I had a 1-quart Emeril brand saucier, which is a perfectly good little saucier, but the keyword there is little. It's only one quart — that means 1 quart when filled to very top. But I often find that it's just not big enough for the amount of sauce I want to make. I needed a 2-quart saucier. 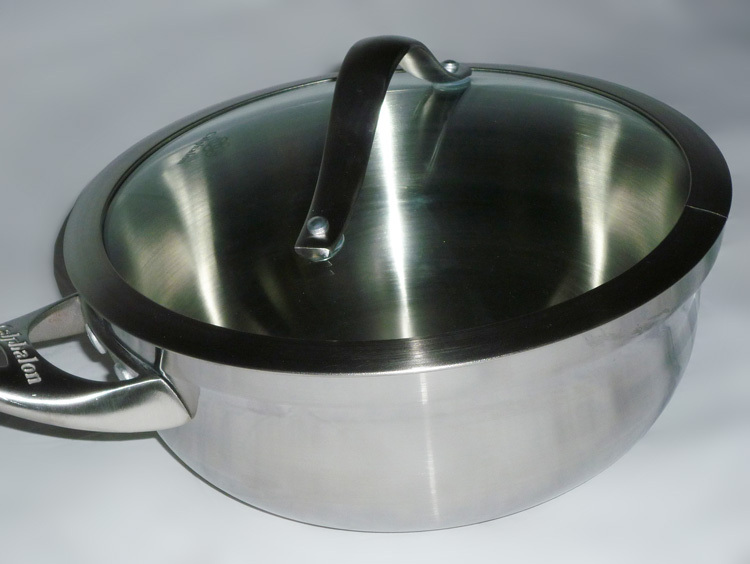 I love my stainless steel All-Clad cookware, and I really wanted to get an All-Clad saucier, but my budget just didn't allow for $100 to $120 or more for a pan to make sauces. So instead I purchased the 2-quart saucier by Calphalon. These run about $50 to $60. Calphalon calls it a Chef's Pan, which is the same thing as a saucier. As it turns out, I think I like this saucier better than the ones from All-Clad — in particular, the handle and the lid. The tempered glass lid lets me keep an eye on my sauces and gravies even when the lid is on. This saucier came with a tempered-glass lid, so I can see what my sauces are doing even when the lid is on. Especially with temperamental sauces, it's important to keep a close on eye on them. Is it simmering nicely? Full rolling boil? Getting too thick or too thin? I can see at a glance what's happening in there. The handle on the lid is great too. It's big enough that I can easily grasp the handle and pick it up even while wearing a thick oven mitt. I particularly like the handle on this pan. 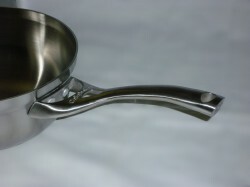 It's a nice wide handle that's easy to grip and to hold onto when picking up a full pot of sauce or soup. The All-Clad cookware is top-notch quality, no doubt, but I think the handle on this saucier from Calphalon puts the All-Clad handles to shame. Isn't the handle on this pan a thing of beauty? 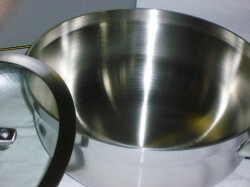 The handle is thicker and wider, and it juts out at a better angle from the pot. It stays cool enough to use without a mitt even when I grip it fairly close to the pan. I think that for future cookware purchases, I'm going to look at the offerings from Calphalon very closely, and I might choose them over All-Clad, just because I like this handle so much. The quality is outstanding. The pan is made with triple-layer construction, with stainless steel outer layers bonded to a full aluminum core that goes up the sides as well as across the bottom. The aluminum core conducts heat extremely well, but the thick stainless steel outer layers keep things from burning. It has a nice heavy, thick bottom. It heats up quickly and cooks evenly. While using this pan, I haven't had any problems with burning. Of course, as with any pan, you do have to be careful not to set the heat too high. The pan is all-stainless, so it's oven-safe and broiler-safe. (The lid is oven-safe, too, to 450°.) Calphalon says it's dishwasher-safe, but I wash all my cookware by hand. The brushed stainless finish cleans up beautifully and easily, even when I've used it for something with lots of sticky cheesy good-ness. Of course, this pan is good for more than just sauces and gravies. I use it for rice, soups, boiling or steaming veggies, potatoes, pasta. I made beer cheese soup in it — first time I ever made beer cheese soup, and it was absolutely wonderful! The only complaint I have about this pan is that I didn't get it sooner.